Astronomers connected APEX, in Chile, to the Submillimeter Array in Hawaii, USA, and the Submillimeter Telescope (SMT)in Arizona, were able to make the sharpest direct observation ever, of the center of a distant galaxy, the bright quasar 3C 279, which contains a supermassive black hole with a mass about one billion times that of the Sun, and is so far from Earth that its light has taken more than 5 billion years to reach us. APEX is a collaboration between the Max Planck Institute for Radio Astronomy, the Onsala Space Observatory and ESO. APEX is a pathfinder for the next-generation submillimetre telescope, the Atacama Large Millimeter/submillimeter Array (ALMA), which is being built and operated on the same plateau. 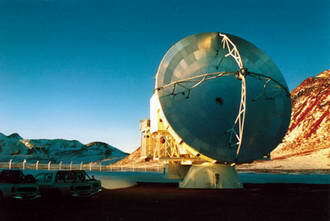 The telescopes were linked using a technique known as Very Long Baseline Interferometry (VLBI). Larger telescopes can make sharper observations, and interferometry allows multiple telescopes to act like a single telescope as large as the separation — or "baseline" — between them. Using VLBI, the sharpest observations can be achieved by making the separation between telescopes as large as possible. For their quasar observations, the team used the three telescopes to create an interferometer with transcontinental baseline lengths of 9447 km from Chile to Hawaii, 7174 km from Chile to Arizona and 4627 km from Arizona to Hawaii. Connecting APEX in Chile (below) to the network was crucial, as it contributed the longest baselines. The observations represent a new milestone towards imaging supermassive black holes and the regions around them. In future it is planned to connect even more telescopes in this way to create the so-called Event Horizon Telescope. The Event Horizon Telescope will be able to image the shadow of the supermassive black hole in the centre of our Milky Way galaxy, as well as others in nearby galaxies. The shadow — a dark region seen against a brighter background — is caused by the bending of light by the black hole, and would be the first direct observational evidence for the existence of a black hole's event horizon, the boundary from within which not even light can escape. The experiment marks the first time that APEX has taken part in VLBI observations, and is the culmination of three years hard work at APEX's high altitude site on the 5000-metre plateau of Chajnantor in the Chilean Andes, where the atmospheric pressure is only about half that at sea level. To make APEX ready for VLBI, scientists from Germany and Sweden installed new digital data acquisition systems, a very precise atomic clock, and pressurised data recorders capable of recording 4 gigabits per second for many hours under challenging environmental conditions. The data — 4 terabytes from each telescope — were shipped to Germany on hard drives and processed at the Max Planck Institute for Radio Astronomy in Bonn. The successful addition of APEX is also important for another reason. It shares its location and many aspects of its technology with the new Atacama Large Millimeter/submillimeter Array (ALMA) telescope. ALMA is currently under construction and will finally consist of 54 dishes with the same 12-metre diameter as APEX, plus 12 smaller dishes with a diameter of 7 metres. The possibility of connecting ALMA to the network is currently being studied. With the vastly increased collecting area of ALMA's dishes, the observations could achieve 10 times better sensitivity than these initial tests. This would put the shadow of the Milky Way's supermassive black hole within reach for future observations. 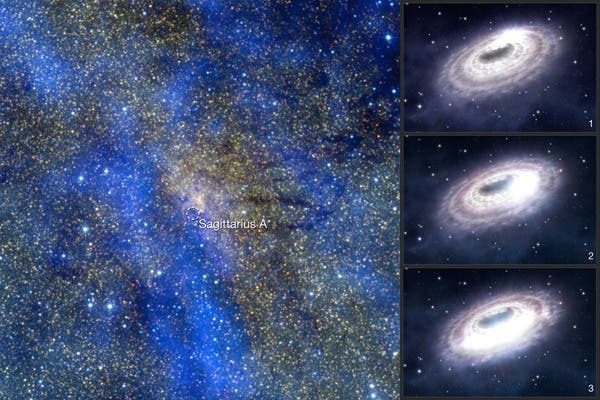 The image below is from two different telescopes that simultaneously observed violent flares from the supermassive black hole in the center of the Milky Way. The outbursts from this region, known as Sagittarius A*, reveal material being stretched like bread dough out as it orbits in the intense gravity close to the central black hole. 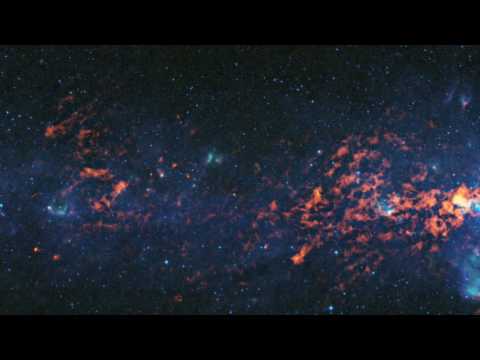 Using ESO’s Very Large Telescope (VLT) and the Atacama Pathfinder Experiment (APEX) telescope, both in Chile, to study light from Sagittarius A* at near-infrared wavelengths and the longer submillimeter wavelengths, astronomers have for the first time concurrently caught a flare with these telescopes.